The study of human brain networks with in vivo neuroimaging has given rise to the field of connectomics, furthered by advances in network science and graph theory informing our understanding of the topology and function of the healthy brain. Our focus is on the disruption in neuropsychiatric disorders (patho- connectomics) and how whole-brain computational models can help generate and predict the dynamical interactions and consequences of brain networks over many timescales. We have been developing methods for which emerging results exhibit remarkable accuracy in mapping and predicting both spontaneous and task-based healthy network dynamics. This raises great expectations that whole-brain modeling and computational connectomics may provide an entry point for understanding brain disorders at a causal mechanistic level, and that computational neuropsychiatry can ultimately be leveraged to provide novel, more effective therapeutic interventions, e.g., through drug discovery and new targets for deep brain stimulation. 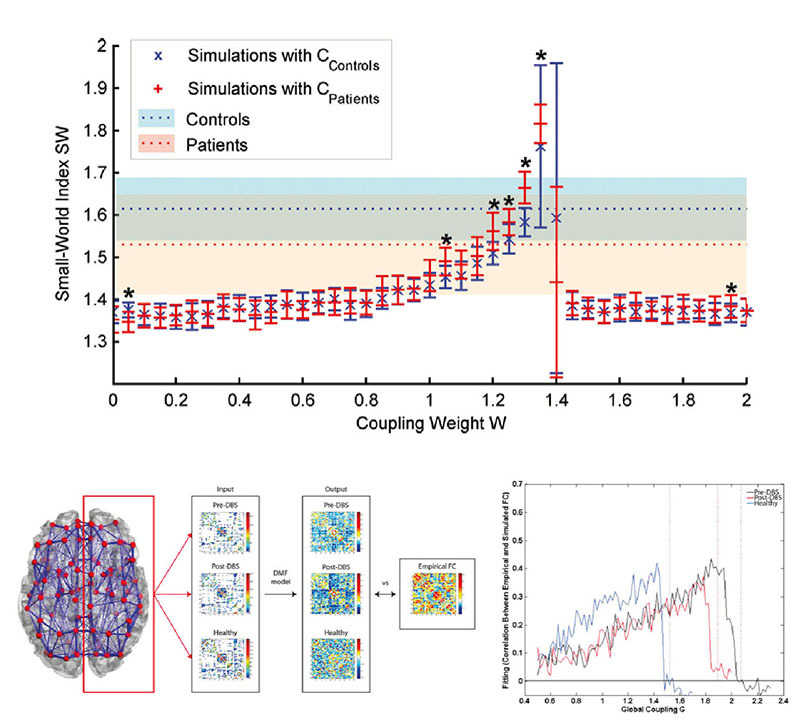 Whole-brain computational modeling was used to simulate functional networks in schizophrenia and health using global integration values reported experimentally. This showed significant fragmentation in the simulated functional networks between the two groups as shown by the number of connected components as a function of graph density and correlation threshold (Cabral et al., 2012a). Similarly, simulations showed that the model predicted well the experimentally observed measures of graph theoretical measures as a function of the coupling strength (Cabral et al., 2012b). Whole-brain computer models have also been useful for other neuropsychiatric disorders such as PD and combined with a causal intervention. A computational model using the changes in pre- and 6-months-post-DBS showed significant recovery of structural network connectivity as a result of using DBS to alleviate the symptoms of PD (van Hartevelt et al., 2014). (Read more in our published paper in Neuron) . 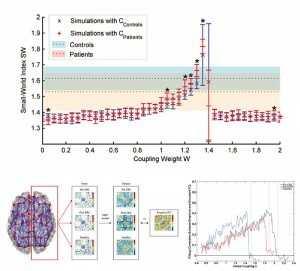 Whole-brain computational modelling is carried out in close collaboration with Prof Gustavo Deco (Barcelona).